One of the earliest known spices in trade, the dried, aromatic flower buds produced by this medium-sized tree are familiar to many of us as a common kitchen spice. Clove contains a number of volatile oils, the most significant of which is eugenol that comprises up to 90% of the total oil produced. Eugenol has numerous medical and commercial applications and continues to be extracted primarily from clove buds, though it can also be extracted from the leaves of the clove tree and from some other plants, such as allspice (Pimenta dioica), in smaller quantities. Clove was originally found only on the Maluku Islands of Indonesia, but in the 17th century fierce competition between warring European nations that sought control of the spice trade eventually led to clove trees being transported all over the world for cultivation. Originating on and around the Maluku Islands of Indonesia, the historical importance of clove in international trade means it is now grown in numerous locations throughout the tropics including Indonesia, Zanzibar, Madagascar, Sri Lanka and parts of the Caribbean. More recently, clove production has begun in the Brazilian state of Bahia. Clove grows best on tropical mountain slopes at lower elevations as part of a mixed forest. Many of the islands to which they are native are volcanic. Overview: A bushy, evergreen tree with a medium-sized crown, growing 8-20 metres tall. Several parts of the tree are aromatic, including the leaves and bark, but it is most valued for the aromatic flower buds, which are usually harvested by hand. Leaves: Simple, bright green and glossy. The lower surface is covered in aromatic oil glands. Elliptical leaves with petioles (leaf stalks) grow up to 13cm long in opposite pairs along numerous short branches. Flowers: Developing in small clusters. Flower buds are initially pale with a glossy, fleshy appearance, turning green and then bright red as they mature. They consist of a long, narrow ovary, approximately 1.5-2.0 cm in length, with four small triangular sepals projecting outwards at one end. The sepals surround a small ball of four overlapping petals that protect the developing flower parts inside. It is in this form that the clove is harvested and dried for use as a spice. If the flower is allowed to mature, the petals fall off under pressure from numerous white-yellow stamens (male parts), which are then revealed. These showy stamens surround a single narrow stigma (female part). Flowering times vary in different parts of the world, and commercial harvesting of flowers begins only once the plant is at least four years old. Fruits: The fruit matures approximately nine months after flowering. The long red ovary of the flower gradually turns a reddish-purple and swells to the size of an olive, but is more oblong in shape with the sepals covering where the flower once was. The fruit contains one, or rarely two, seeds and is often referred to as the 'mother of cloves'. Cultivated clove trees are rarely allowed to reach fruiting stage. Probably the most significant period in the history of the clove trade began with the Dutch War of Independence, during which the Netherlands was excluded from Lisbon spice markets by Philip II of Spain. 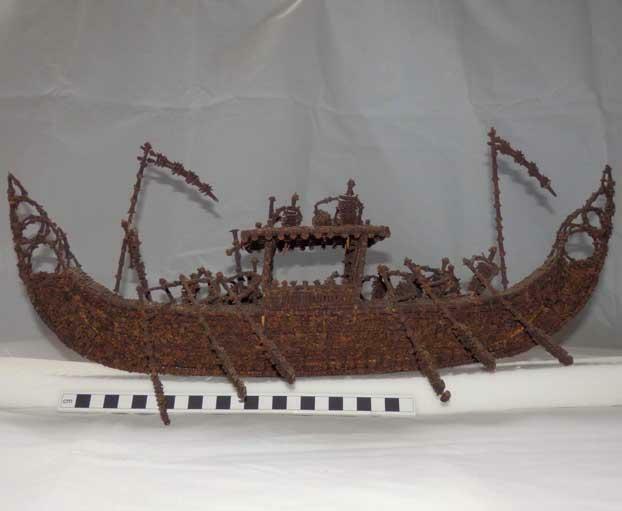 This forced the Dutch to seek access to spices at their source and prompted the invasion of the Portuguese-ruled Maluku Islands by the newly established 'VOC' - the Dutch East India Company - in 1605. 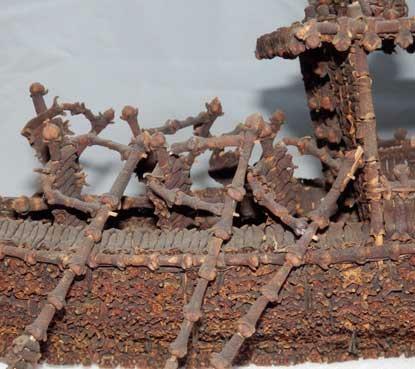 The Dutch seized control of the region and its spice trade from the Portuguese, and then set about systematically destroying all clove trees they could find, apart from those on their most fortified islands where they could more easily maintain a monopoly on production. Unauthorised growing or trading of clove was a crime punishable by death, and many native clove-growing communities, as well as representatives of the rival English East India Company, suffered torture and brutal massacres during these struggles. The Dutch also limited clove exports to keep prices high, which had a dramatic impact on world trade and helped fuel an era of profound wealth in the Netherlands lasting more than a century. 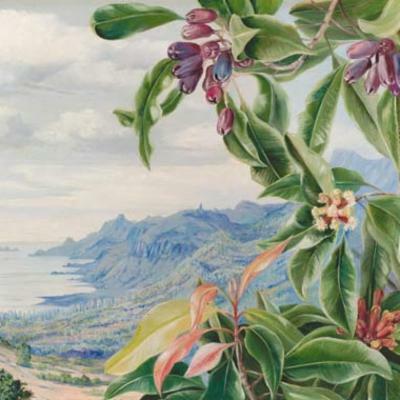 Unfortunately for the Dutch East India Company, clove trees were still too easy to obtain, and the French managed to smuggle plants from the Maluku Islands to Mauritius and Réunion in 1772. 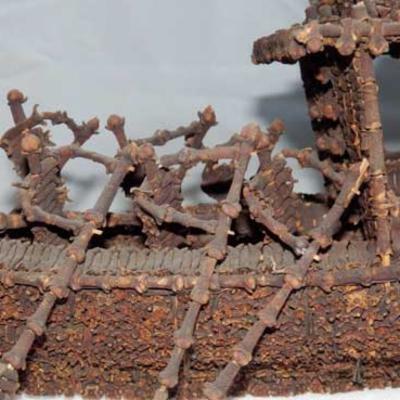 From here, plants were transferred all over the world, including in 1818 to Zanzibar, which became the world's largest producer of cloves for more than 100 years. No specific threats to clove have been established, but as with many cultivated crops, the genetic diversity of many groups of commercially grown clove trees is likely to be limited due to the small number of specimens originally introduced into each region. In addition, it is thought that clove is likely to self-pollinate, which further limits opportunities to improve diversity within groups of trees. As an important economic crop, clove is therefore a candidate for some crop improvement programmes that aim to breed and select plants with a view to improving diversity and increasing resistance to pests and diseases. 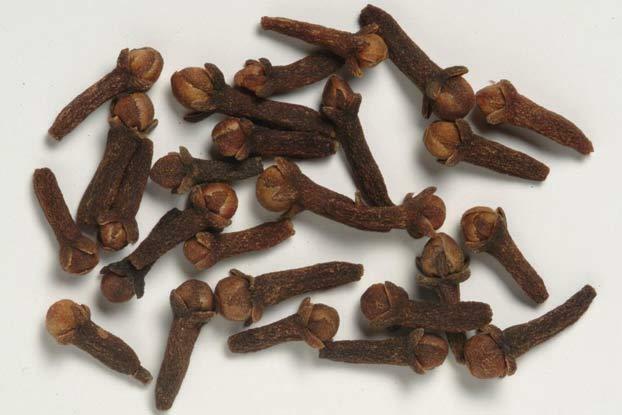 Clove is most famous for its use as a spice and has been valued for centuries for the unique flavour and preservative qualities it can impart to food. In Europe, whole cloves are commonly pressed into red meats before cooking and are also included in many seasonal dishes, such as mulled wine at Christmas. Clove is an important ingredient in many spice mixes, including most garam masala and Chinese five-spice mixes. Although best known in Asian medical systems such as Ayurveda, clove has numerous applications in traditional and modern medicine with a broad range of different therapeutic effects having been reported. In particular, its confirmed antimicrobial, antifungal, antiviral and anti-inflammatory properties have made it popular for treating a variety of different infections, for example as a gargle for sore throats or for cleaning minor wounds. It is also commonly used for digestive complaints because of its antispasmodic action, and some studies report that clove can reduce the likelihood of gastric ulcer formation. Modern research interest into the uses and efficacy of clove is high, with numerous studies investigating it for anti-carcinogenic, chemoprotective and other properties. Some studies have also shown that clove can work synergistically with other medicinal plants to fight bacterial infection more effectively. Clove is well known as a traditional home remedy for mild toothache and inflammation of the mouth because of its analgesic and antiseptic effects. It has also been traditionally used to treat bad breath and tooth decay and has a long history of use in dentistry. Eugenol, the primary constituent extracted from clove, is still used in several dental products and processes today. In particular, it is common practice to use a cement made from 'ZOE' - zinc-oxide and eugenol - as a temporary filling to protect and sedate inflamed tooth pulp ahead of permanent filling or root canal. Clove oil is an ingredient in several popular perfumes and also the source of raw materials used for manufacturing fragrances and flavourings. Oils are often extracted from the leaves of the tree as well as the flower buds for fragrance manufacturing purposes. 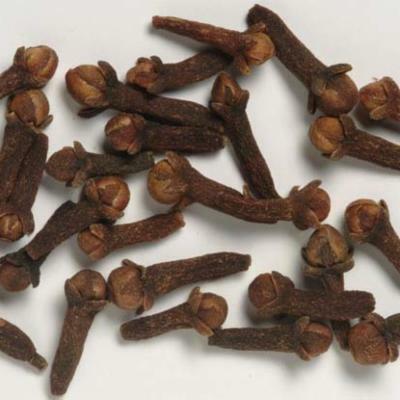 Clove was also formerly used to synthesise vanillin - artificial vanilla flavouring. The clove genus, Syzygium , has its centre of species diversity in South and Southeast Asia, with some species in Africa. Syzygium is a mega-diverse genus of trees with more than 1,000 species. These species make up a significant proportion of the Southeast Asian wet tropical forests but are often impossible to tell apart or identify. Kew researchers are working with Syzygium morphology, genetics and ecology to understand how best to classify and identify these species - a necessary step towards conservation of the often-threatened forests in which they are found. 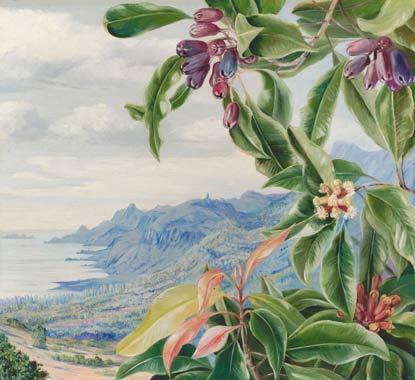 Marianne North's painting 492 ' The Clove in fruit, and view over Mahe, Seychelles ' is on display in the Marianne North Gallery at Kew. 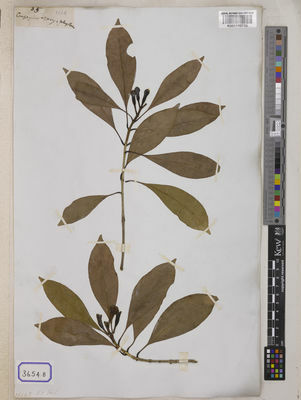 Kew's Economic Botany Collection contains over 90 specimens relating to clove, including whole cloves from numerous different regions and samples of wood from clove trees. 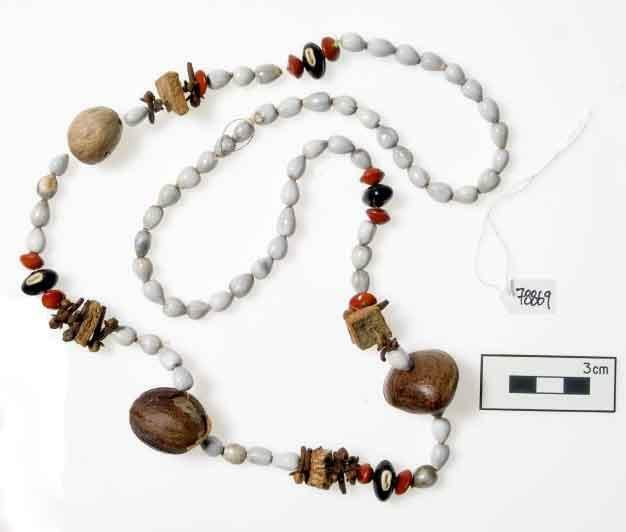 Of particular interest are a Spanish necklace made from a variety of different seeds including clove, and an 1854 model of a Malay pleasure boat made entirely from cloves sewn together with pineapple fibre. 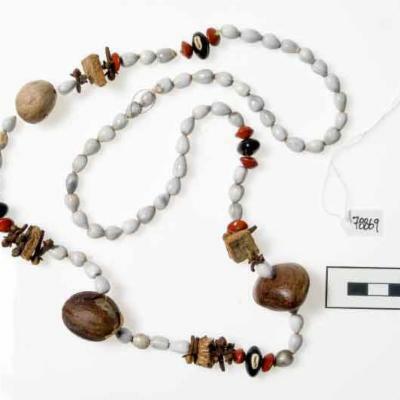 Items in the Economic Botany Collection are made available to researchers by appointment. Native to lower forests of the Indonesian Islands of Maluku, but more common as a commercial crop in many parts of the tropics. Locally abundant and widespread in cultivation, although genetic diversity in some cultivated groups is low. Generally safe in dried form but allergic reactions possible, especially after chronic exposure. The essential oil is an irritant & mild to serious adverse reactions can result from continuous use, or topical or internal use without sufficient dilution. Tree 5–21 m tall, much branched with a bushy conical crown. Leaves pink when young, rather shining, elliptic or oblong-elliptic, about 10x5 cm, very narrowly attenuate at the base, smelling of cloves when crushed. Flowers in terminal cymose clusters; unopened buds green, pinkish or brilliant crimson; opened flowers purplish, about 6 mm wide but petals soon falling. Fruits dark purple, oblong-ellipsoid, 2–2.5 cm long, 1.3 cm wide, juicy, usually 1-seeded. Byng, J.W. & al. (2016). 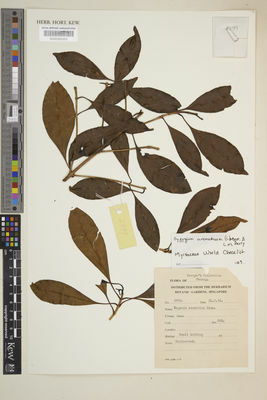 Revision of Eugenia and Syzygium (Myrtaceae) from the Comoro archipelago Phytotaxa 252: 162-184. Soepadmo, E., swa, L.G., Chung, R.C.K. & Kiew, R. (eds.) (2011). Tree Flora of Sabah and Sarawak 7: 1-450. Sabah forestry department. Forest research institute and Sarawak forestry department, Malaysia. Cortés-Rojas, D. F., de Souza, C. R. F. & Oliveira, W. P. (2014). 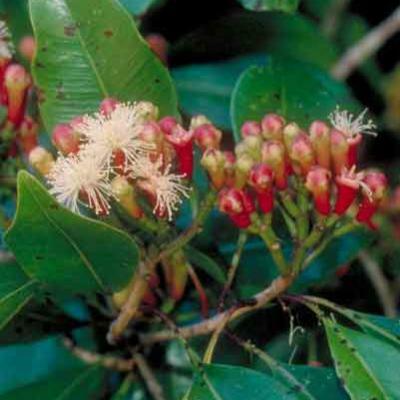 Clove ( Syzygium aromaticum): a precious spice. Asian Pacific Journal of Tropical Biomedicine 4(2): 90–96. Danthu, P. et al. (2014). The clove tree of Madagascar: a success story with an unpredictable future. Bois et Forêts des Tropiques 320(2): 83–96. Kamatou, G. P., Vermaak, I. & Viljoen (2012). 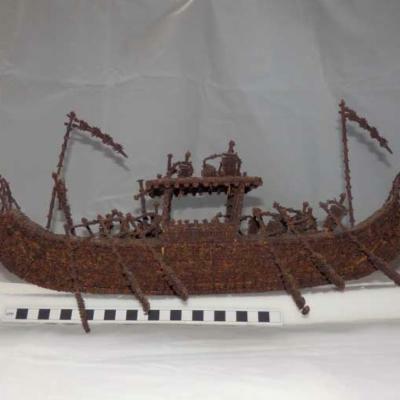 Eugenol - from the remote Maluku Islands to the international market place: a review of a remarkable and versatile molecule. Molecules 17: 6953-6981. MDPI. European Medicines Agency (2011). Community Herbal Monograph on Syzygium aromaticum (L.) Merill et L. M. Perry, floris aetheroleum (Final). European Medicines Agency (EMA)/ Committee on Herbal Medicinal Products (HMPC). Orwa C. et al. (2009). Agroforestree Database: A Tree Reference and Selection Guide (version 4.0) – Syzygium aromaticum. Katzer, G. (last modified 2008). 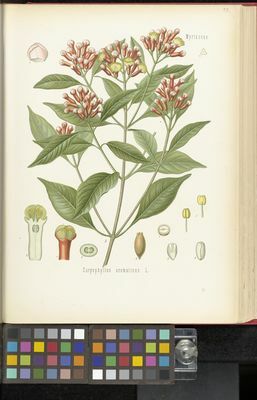 Gernot Katzer’s Spice Pages: Cloves ( Syzygium aromaticum [L.] Merr. et Perry). Banerjee, S., Panda, C. K. & Das, S. (2006). Clove ( Syzygium aromaticum L.), a potential chemopreventive agent for lung cancer. Carcinogenesis 27(8): 1645–1654. Anon (2004). 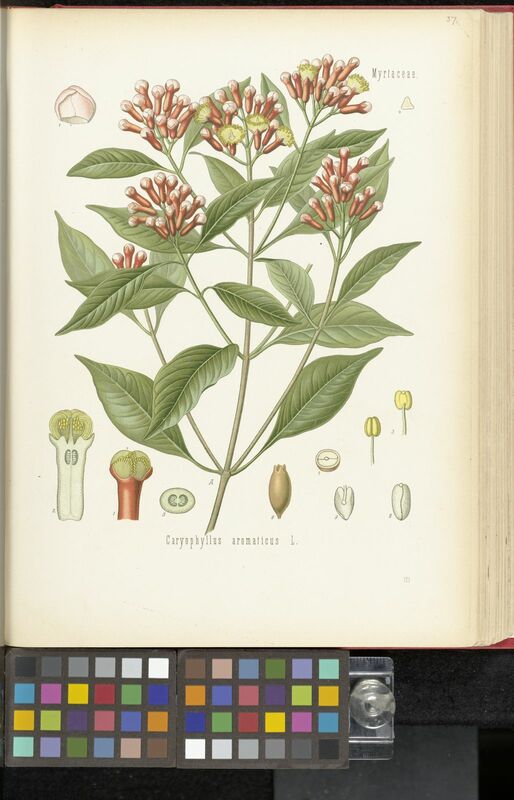 WHO Monographs on Selected Medicinal Plants, Vol. 2: Flos Caryophylii. World Health Organization, Geneva. Ved, D. K. et al. (eds) (2002-2014). 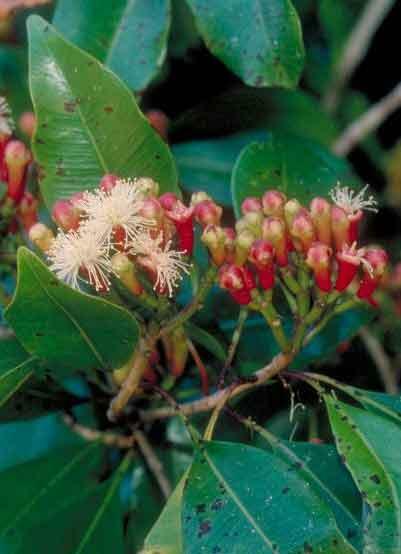 Traded Medicinal Plants Database: Syzygium aromaticum (L.) Merrill & Perry. FRLHT's ENVIS Centre on Medicinal Plants, Bangalore. Svoboda, K. P., Svoboda, T. G. & Syred, A. (2001). A closer look: secretory structures of aromatic and medicinal plants. HerbalGram 53: 34–43. American Botanical Council. de Guzman, C. C. & Siemonsma, J. S. (eds) (1999). Spices PROSEA: Plant Resources of South-East Asia 13. Backhuis Publishers, Leiden.